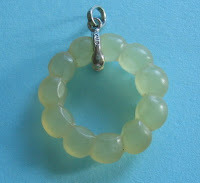 Still on the theme of BIS, although strictly speaking the jade objects that I show on this post cannot be called Bis. However as their forms are mostly flat, circular and with a hole in the center I have lumped them as such and hope that purists will not hammer me. The 3 bis in the above pic have a border made up of a "continuous chain of scooped out surfaces," somewhat like a concave hollow of a small saucer. According to my jade seniors(shifus) this scooping out of jade surfaces is a hallmark of Ming period jade. Left Pic above shows 2 bis with off-centre holes. 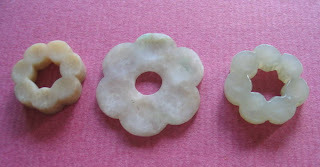 The first piece is shaped and carved as a flower while the right item also has a border of scooped out surface plus a centre decoration of a flower. They make nice present day pendants. The 3 bis in the last picture show different kinds of twisted rope design. 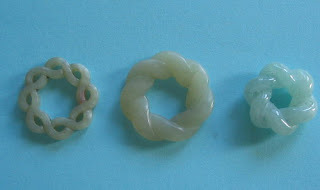 The first bi shows a thin intricately worked twisted rope, the middle is thick and flat while the one on the extreme right is fat and bulbous. Broadly speaking the first two are of Ming-Qing vintage and the last is a modern piece. I love collecting these small jade objects and accessories and hope I have not been too off the mark in my descriptions and identification. Otherwise shifus out there may well give me a knock on the head ! !